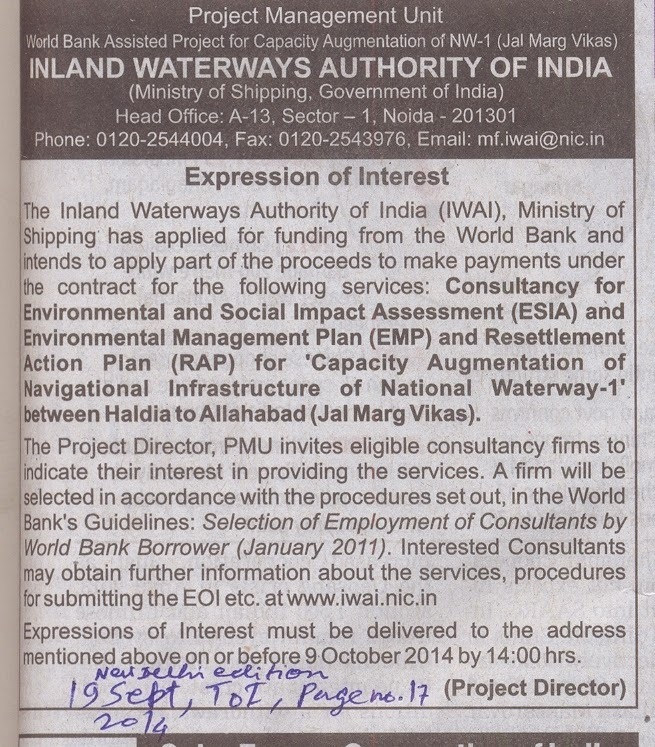 The advertisement of Inland Waterways Authority of India (IWAI) reveals that Ministry of Shipping, Government of India has applied for World Bank funding to make payments for consultancy for preparing Environment and Social Impact Assessment (ESIA), Environment Management Plan (EMP), Resettlement Action Plan for Capacity Augmentation of Navigational Infrastructure of National Waterway -1 between Haldia to Allahabad (Jal Marg Vikas). This Ad reveals that government has not abandoned the Ganga Waterway project as was reported by Dainik Bhaskar citing Narendra Modi. (Modi was quoted as saying, " Mujhe Ganga se kuch nahi lena hai, Mujhe Ganga ko dena hai" (I don't need to take anything from Ganga, I have to give to Ganga). Reacting to the proposal of Ganga Waterway, Ramaswamy R. Iyer, former Secretary, Union Ministry of Water Resources said, "I feel that we should say that navigation should not be given over-riding priority on the Ganga to the detriment of all the other functions that the Ganga performs. If the proposed barrages are built, the Ganga will become solely a navigational channel and will cease to be a river. This ought to be unacceptable to the Ministry of Water Resources if they have any concern for the national and holy river, responsibility for which has just been transferred to them from Ministry of Environment and Forests with a new mandate for 'rejuvenation'." 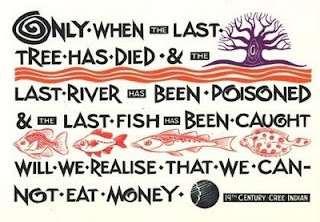 The proposal is not a rejuvenation plan for the river, it is a plan for the exploitation of the river. Its main purpose is river bed mining from Haldia to Allahabad to extract minor minerals like sand, gravel etc to meet the unsatiable demand of the construction industry. Prof. G D Agrawal who went on a fast unto death to save the river is the opinion that the project is misleading people in the Ganga basin about its main purpose-which dredging of the river course to extract sand and other minor minerals. This project endangers the existence of the river and its basin. Ganga Bachao Samiti (GBS) has initiated efforts to raise public awareness about the far reaching consequences of this project of Ministry of Shipping.